Small cap stocks are waiting games and a risky bet — some will pay handsomely, while others could cost you dearly. The ASX Small Ords is up 21.82 per cent since December 3, 2013 showing on average small caps have gained, but most only moderately. But if you are patient and pick the right companies, payoffs can be exponential, and these mining stocks prove it. 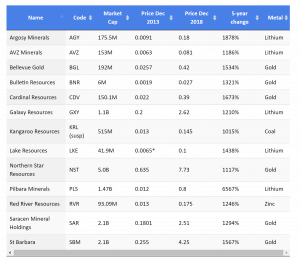 Stockhead’s analysis of all ASX companies that have been listed for five years or more (1412 out of the 2245 listed companies) found 13 small cap miners that have made gains of more than 1000 per cent since December 2013. Of these, seven are gold miners and four are lithium miners. The remaining two produce zinc and coal. The two largest gainers are Western Australian lithium miners Pilbara Minerals (ASX:PLS) and Argosy Minerals (ASX:AGY). From a starting point of 1.2c in December 2013, Pilbara Minerals now is 80c, notching a gain of 6,608 per cent. Today, Pilbara Minerals has the second biggest lithium operation in Western Australia. Currently operating at 2 million tonnes per annum, the company last month pledged to expand to 5 million tonnes per annum. The ASX Small Ordinaries over the past five years. Argosy, meanwhile, is a long way behind but has still gained roughly 1,829 per cent — soaring from 0.91c to 17.5c. Much of the company’s share price appreciation has occurred in the last 18 months as it advances its Rincon lithium project in Argentina. Yet Argosy’s current share price is a significant pullback from the one-year high of 48c it reached in January. The company is working towards bringing its Rincon project into production. There are another three lithium miners that have gained more than 1000 per cent in five years — Lake Resources (ASX:LKE), AVZ Minerals (ASX:AVZ) and Galaxy Resources (ASX:GXY). The latter is now a ‘large cap’ and a member of the ASX 200 Index. Its larger market cap can be attributed to its diverse portfolio, with projects in Australia, Argentina and Canada; as well having more cash in the bank than its fellow lithium mining peers. Of the remaining nine stocks, seven are gold miners. Unlike other minerals, gold is usually unaffected by inflation or geopolitics. While there has been significant uncertainty emerging in the last five years in those areas, investors have still sent seven stocks up by over 1000 per cent. The biggest winner was Cardinal Resources (ASX:CDV). The Ghana-focused miner has an interest in five tenements and has already recovered gold from some of its tenements. The company is also listed in Toronto and earlier this year secured a $US25m facility from local mining financier Sprott. Narrowly behind is Australia and PNG-focused gold producer St Barbara (ASX:SBM). The company has generated a profit from its operations of $297m. The odd two stocks (that are neither gold or lithium explorers) are coal miner Kangaroo Resources (ASX:KRL) and zinc miner Red River Resources (ASX:RVR). Kangaroo Resources has an interest in 14 coal concessions in the Indonesian province of East Kalimantan, as well as one in Queensland. 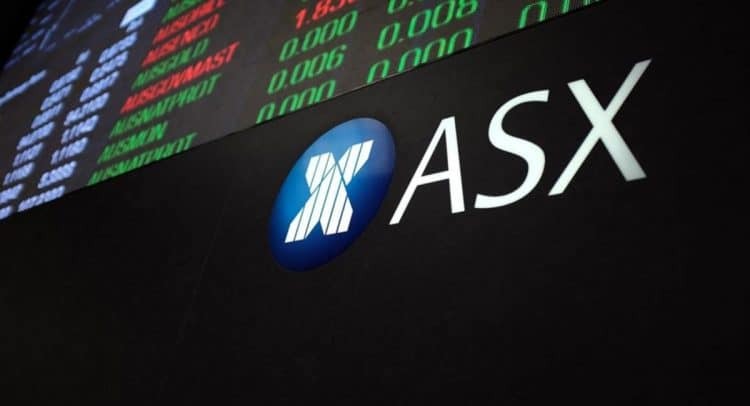 The company is being delisted from the ASX after being swallowed up by its biggest shareholder, PT Bayan Resources. Red River, meanwhile, boasts that it “set out to acquire and develop operation assets to generate superior financial returns within a five-year timeline” and noted it had achieved this. While the company’s initial projects were acquired from liquidated companies, it continues to hold these leases and is showing no signs of slowing down, continuing to produce minerals and is modestly profitable. The success of these stocks come despite the commodities market bottoming out in January 2016 and, according to Matthew Kaleel from Janus Henderson, the market is still in a recovery mode. In this context lithium and gold have been popular because of strong market demand immune from geopolitics or even economic circumstances such as inflation. However, Janus Henderson’s head of diversified alternatives, David Elms, warned investors may seek diversification in 2019 as GFC stimulus is finally withdrawn from the economy and investors seek alternative investments that promise attractive returns but have little or no beta with traditional assets. “Delaying asset allocation away from risk assets has hitherto been profitable and the best decisions,” he said. While these stocks have recorded exponential gains, and the commodities markets (particularly lithium and gold) have been solid, whether the momentum will continue remains to be seen.